This tour starts and ends in Boise, Idaho and includes some great riding in the Pacific Northwest. We’ll ride parts of Idaho, Washington, Oregon and Montana. This tour is all about the journey and not so much about the destinations. Daily destinations are small towns that allow us to avoid traffic and the congestion of major cities and national parks. In reality, this is what riding is all about! If you would like to arrive earlier or stay longer, we can assist you with accommodations. We’ll start this adventure by riding west out of Idaho and into the farmland of eastern Oregon. The riding starts off pretty mellow which will give you a chance to get use to a (possibly) strange bike on strange roads. However that all changes after lunch as we attack a twisty road over Dooley Mountain summit (5,400 feet) known as Oregon’s “Little Dragon”. We'll head southwest on curvy highway 7 over Tipton summit in the Blue Mountains then we’ll follow the John Day River northwest to highway 395. There’s not much for stops along here, just fun roads and great scenery. The old “organic” roads follow the creeks and rivers which is why they are so fun. Pendleton is cowboy country, home of the historic Pendleton Roundup Rodeo. We'll work our way southwest and experience lots of elevation changes as we go from farmland to prairie to forests and back again. Again, it’s rivers and canyons that make for fun riding. We’ll cross the Blue Mountains again as we head east through Baker City and follow the Powder River to our lunch stop in Richland. From there we’ll climb into the Willowa Mountains to our destination. Along the way, we’ll take a side trip to an overlook of Hells Canyon, the deepest canyon in America. We’ll follow highway 3 north to Buford Grade in Oregon, across the Grande Ronde River then up Rattlesnake Grade in the very southeast corner of Washington. We’ll follow the Snake River for a while then into the rolling wheat fields of eastern Washington. Dayton is an interesting small town with the oldest train depot in the state. Today’s ride will take us into the heart of the Palouse area, famous for miles of rolling wheat fields. We’ll take a side trip to scenic Palouse Falls and another for a ride up Steptoe Butte for a commanding view of the area. Cheney is a small college town, home of Eastern Washington University. We'll ride rural farmland in eastern Washington and around the (relatively) large city of Spokane. 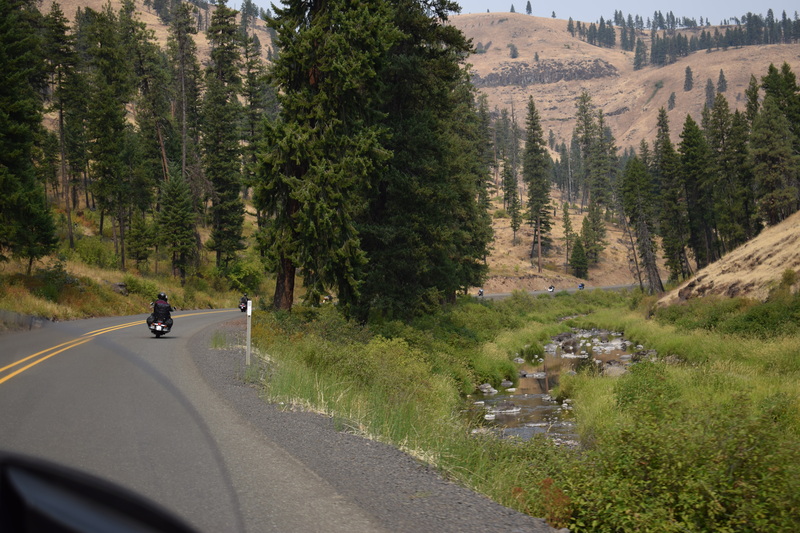 Well ride into Idaho and follow the Pend Oreille River through Sandpoint and along Lake Pend Oreille then follow scenic highway 200 along the base of the Cabinet Mountains to Thompson Falls. We'll ride west back into Idaho towards Coeur d’Alene, turning south to follow the eastern shoreline of Lake Coeur d’Alene to our lunch stop in Harrison. We’ll continue south through forest wilderness and farmland to our small-town destination of Orofino on the scenic Clearwater River. Today is a perfect example of taking the long way between two points. Why? Because it’s the most scenic and fun! The direct route is half this distance. Again, it’s rivers and canyons that make for fun riding as we follow the route of Lewis and Clark through the Bitterroot Mountains along the beautiful Clearwater and Lochsa Rivers to our destination at Lochsa Lodge. We’ll finish our ride over the Bitterroot Mountains and into the beautiful Bitterroot Valley in Montana before riding over Chief Joseph Pass and on to Challis which is seemingly surrounded by Mountains. Thanks to light traffic, it’s easy to set a brisk pace while still enjoying great scenery. We’ll follow highway 75 for some great views of the Sawtooth Mountains, over Banner Summit (7,020 feet) and a lunch stop in Lowman. From here the road gets real twisty on our way through the historic mining town of Idaho City before straightening out as we approach the Boise Valley and back to our starting point in Meridian. All-in-all, almost 2,300 miles of smiles!